Fingertip Facts provides a brief overview of University student enrollment and demographic information by level, classification, and entry status. The primary function of Fingertip Facts is to provide preliminary enrollment information as early as possible in the semester. The data presented should not be considered official for any purpose. Please also note that previous years’ figures represent official certified data as of the census date. Fingertip Facts is published each fall, spring, and summer (Summer I and II combined, unduplicated) semesters. The report is based on preliminary data extracted from the student information system on the 1st, 5th, and 12th class day for fall and spring semesters and on 1st, 4th, and 15th class day data for the Summer I, II, and 10 Week sessions. The preliminary data contained within the report do not include any edit corrections and this report is never certified. Upon completion of the Enrollment Profile report, Fingertip Facts is removed from the DARS website. 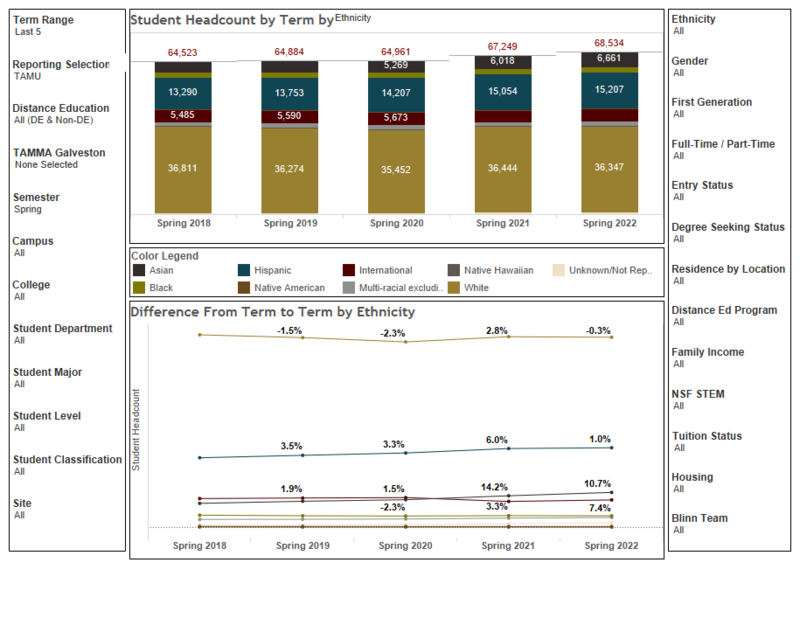 Enrollment Profile report provides in-depth data of student enrollment by multiple variables. It is based on a data file that is a subset of the “DARS Compass Extract”, which DARS requests from EIS. Student enrollment and demographics are presented by campus, university, college, department and major as well as by level and classification. Special population information includes data for Top 10% students, First-Time in College students, Blinn TEAM, and housing information. Geographic distribution data details county, state, and country feeder patterns. The University profiles are presented in the first seven tables. Information on Campuses of College Station, Galveston, and Health Science Center only include those students that are reported to THECB (i.e., out-state distance education students are excluded). Enrollment Profile report is published each fall, spring, and summer (I and II combined, unduplicated) semesters. The report is made available soon after the beginning of each semester based on edited, but not yet certified, data extracted from EIS on the 20th class day for fall and spring semesters and the 15th class day of the second session for the combined summer semester. The original production of the report will indicate clearly in letters NOT CERTIFIED. After the data become certified, DARS will reproduce the Enrollment Profile and publish it on the website; very few changes, if any, should occur by certification time. The COMMON DATA SET (CDS) initiative is a collaboration effort among higher education data providers and publishers such as the College Board, Peterson’s, U.S. News & World Report and Wintergreen/Orchard House. The combined goal of this collaboration is to improve the quality and accuracy of information involved in a student’s transition into higher education as well as to reduce the reporting burden of data providers. The CDS is a set of standards and definitions of data items rather than a survey instrument or set of data represented in a database. Each of the higher education surveys conducted by participating publishers incorporates items from the CDS as well as unique items proprietary to each publisher. Consequently, the publishers’ surveys differ in that they utilize varying numbers of items from the CDS. For more information about this report, please refer to the DARS Report Primer. Beginning with Fall 2013, the CDS includes the Galveston* campus and the Law School. Beginning with Fall 2014, the CDS includes the Health Science Center* as applicable. * see notations under section titles indicating which campuses are included. This report is updated continually throughout the year as data from multiple sources become available. 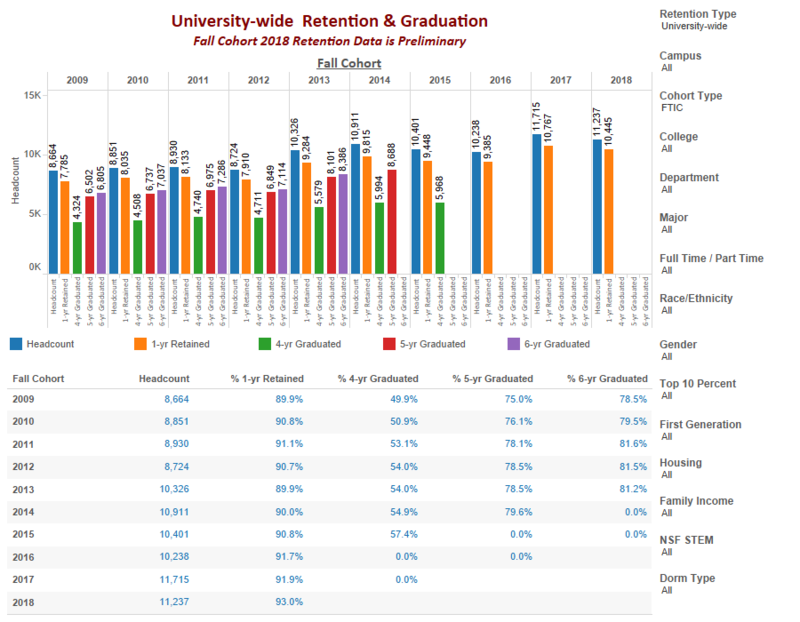 For each cohort the reports shows one- to six-year retention/graduation (as available), split by various demographic categories. Retention and graduation are calculated for each student based solely on Universal Identification Number (UIN). DARS constantly attempts to improve the accuracy of this report by updating the changed UIN’s. Retention and Graduation Profile for each fall semester is usually produced in the middle of the fall semester. The report is based on certified student data from the DARS data warehouse. Additional Retention and Graduation information can be found on the Accountability Website. Applied/Admitted/Enrolled Report is published each fall semester. The report is made available after the official census day (12th class day) using data from the Admissions File and the Student File. Additional Applied/Admitted/Enrolled information can be found on the Accountability Website. This report presents descriptive information on the students entering Texas A&M University. Students applying for admission at TAMU as freshmen are required to submit scores from either the Scholastic Assessment Test (SAT) or the American College Testing Assessment (ACT). The SAT and ACT scores reported in this document are the scores used for admission. If a student took both the SAT and ACT, only the "higher" of the two scores was included. Students applying for admission as freshmen are also expected to supply information regarding their rank in their high school graduating class. Many entering freshmen at TAMU take the precalculus examination for mathematics placement. Some students also elect to take the SAT II Tests in writing and mathematics. Students applying for admission to graduate programs are generally required to submit scores on the Graduate Record Examination (GRE) or the Graduate Management Admission Test (GMAT). These students also supply information regarding their undergraduate programs including their undergraduate GPRs. International students are also required to submit scores from the Test of English as a Foreign Language (TOEFL). This report presents the test score information separately for US residents and international students. Summaries are provided for the first-time freshmen enrolled in the fall semester and for the graduate students who began their programs in the fall semester. Similar information is included for international freshmen and graduate students. This report contains official overall student headcounts starting from 1923 through the most recent Fall semester.